The Verderflex Dura pumps are providing performance benefits for Peterson Packaging. Transferring ink from storage containers to the rollers on printing machines was proving problematic for Danish company, Peterson Packaging. Air diaphragm pumps were responsible for the job but had proved unable to handle the water-based ink gently enough. As a result, bubbles formed in the ink, ruining the packaging, creating excess waste and adding expense. To resolve the problem Peterson Packaging researched the market for a gentle-action pump to ensure bubble-free ink. The chosen design also needed to be both cost effective and sufficiently compact to fit into the limited space available. 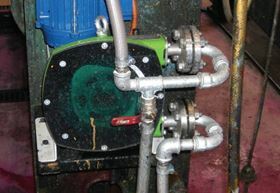 The Verderflex Dura peristaltic pump proved the ideal solution. Ink is completely contained within the pump's hose which is compressed by a rotating roller. On restitution of the hose the resulting vacuum draws in more liquid creating a gentle and accurate pumping process. The design eliminates any danger of cross contamination or spillage. The Verderflex Dura has a unique design that provides a 70% smaller footprint to similar pumps. This was an important attribute for Peterson Packaging as it required five pumps to fit in a tight space at the end of each print line. As well as overcoming the space constraints the Verderflex Dura pumps are now delivering important performance benefits for Peterson Packaging. In addition to transferring bubble-free ink, the pumps are proving very easy to clean and maintain. They can even run dry without fear of damage and downtime is greatly reduced as the only wearing part is the hose. Colour change is also quick and easy. The pump rotor is mounted directly over the bearings, so there is no overhung load, further reducing the number of parts. The rotor has been designed so it requires no shims, simplifying installation and reducing its overall power consumption. The Dura runs at a significantly lower operating temperature than equivalent pumps and hose life is improved by up to 40%. Another contributor to its longevity is the custom engineered construction of the Verderflex hose. This increases strength in the reinforced layers between the rubber and maximises the fatigue strength. In combination with the advanced rotor profile, the superior hose design ensures greater up-time of the pump. The bearing construction is sealed for life and centrally absorbs the forces released in the pump. This results in quieter operation and a more durable pump and drive. Other features specific to this pump include an improved frame design and a one-size-fits-all slotted flange to connect the pump to the pumping station. Peterson Packaging confirms that the pumps are certainly proving more efficient and quieter to run than their unsuitable and expensive forerunners. “We are very happy with the Verderflex Dura pumps and have now installed a total of 15 units into our printing process,” the company's engineering manager concluded. Weir Minerals integrates Delta Industrial™ valves manufacturing operations into its state-of-the-art facility in St Louis, Missouri, USA. The pumps, by Vogelsang, have been designed to gently pump grapes, grape must and wine.